"Take 800 children, 35 teachers, 45 farmers and helpers, 10 chefs and 5 vicars, mix with fresh air and the wonderful Somerset countryside, and you have the perfect recipe for another Mega Harvest Festival"
Bus in 700 children from local schools on a fine Autumn day in September 2004 to Staple Farm and you have the first Taste the Harvest Event. The large grain store full of wheat seeds, enough to make 1.5 million loaves of bread. Ending with a funky Harvest Thanksgiving Service, the children had a wonderful time. 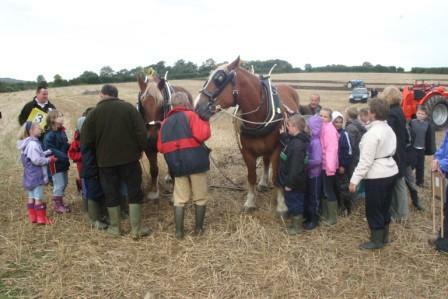 "to reconnect children with food and countryside"
"to promote healthy living via a direct experience of food, farming and countyside"
"to create a first-hand memorable learning experience that children will always remember"